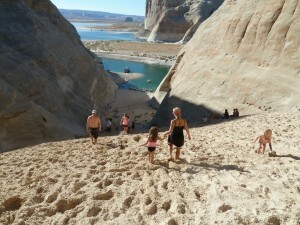 Bullfrong: We love to go to Lake Powell and I have gone many times. Rent a Houseboat out of Bullfrog Marina and drive it until you find a canyon where you can park it. The Lake is so big you are usually seculded. 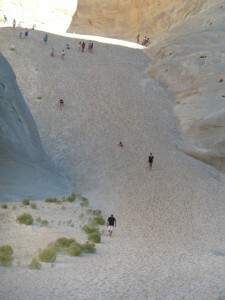 It is beautiful and has many cliffs of red rock and sand. It is fun to go boating, Jet Skiing or fishing. A lot of boats have slides for the kids. Bring your golf clubs and make your own golf course. 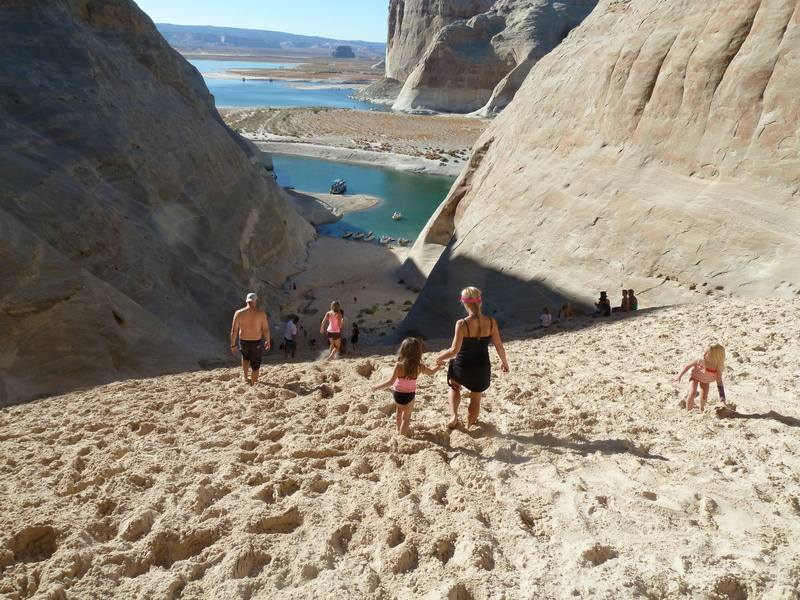 Wahweap: The houseboats can get really pricey and can be dangerous if you have small children, so if you prefer, go camping at Lone Rock Campground near Waheap Marina. Waheap has a nice big beach. You can bring a Motorhome, Trailer or just a tent and camp steps away from the water. Don’t drive too close or too far from the water at the campground because you can get stuck in the sand. There is a huge beach there with shallow water that gradually goes deeper and is great for small children. There are Sand Dunes, so bring some dune buggies, four wheelers, or dirt bikes. The marina is close by and they have rentals if you don’t have your own boat. They don’t take reservations, first come first serve and it costs a total of $10-15 for a full two weeks depending if you are in a tent or have a trailer. There is a dump station along with flush toilets and showers. There is a huge lone rock in the middle of the water where you can kayak or canoe to. 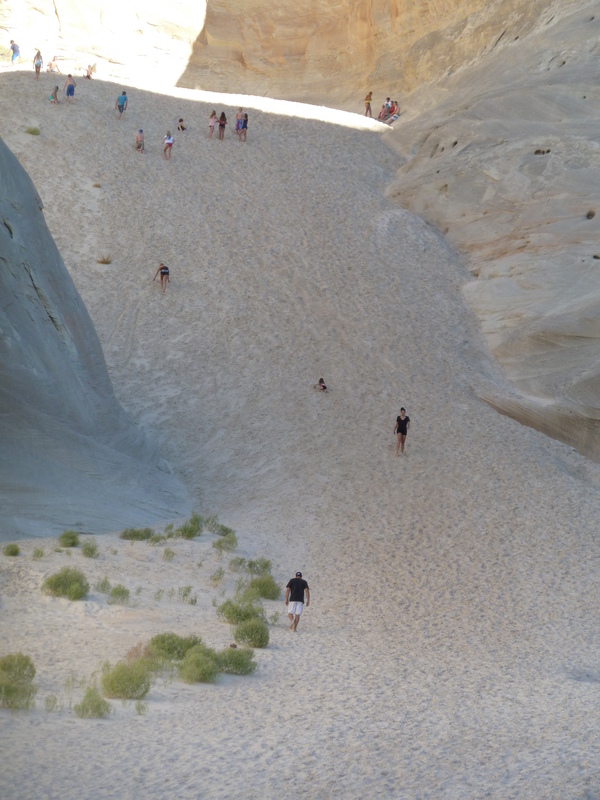 A short boat ride away there is a huge steep sand hill that you can hike up, then race, jump or roll down (See the picture). The kids love it!!! Don’t go camping over the 4th of July, it gets way too crowded. August will be really hot. Sept is a good time to go. October will get pretty cold at nights and in the morning then heat up by the afternoon. For the warmest water, go end of July through Beginning of September. If you don’t like to camp, then there is a town about 10 minutes away from Lone Rock where you can stay in a hotel in Paige AZ.